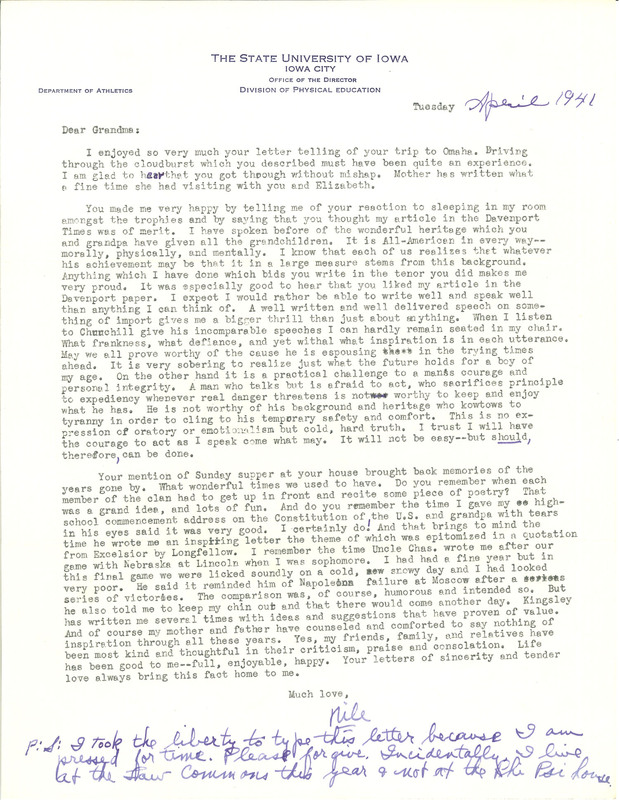 Tuesday April 1941 Dear Grandma: I enjoyed so very much your letter telling of your trip to Omaha. Driving through the cloudburst which you described must have been quite an experience. I am glad to hearthat you got through without mishap. Mother has written what a fine time she had visiting with you and Elizabeth. You made me very happy by telling me of your reaction to sleeping in my room amongst the trophies and by saying that you thought my article in the Davenport Times was of merit. I have spoken before of the wonderful heritage which you and grandpa have given all the grandchildren. It is All-American in every way-- morally, physically, and mentally. I know that each of us realizes that whatever his achievement may be that it in a large measure stems from this background. Anything which I have done which bids you write in the tenor you did makes me very proud. It was especially good to hear that you liked my article in the Davenport paper. I expect I would rather be able to write well and speak well than anything I can think of. A well written and well delivered speech on something of import gives me a bigger thrill than just about anything. When I listen to Churchill give his incomparable speeches I can hardly remain seated in my chair. What frankness, what defiance, and yet withal what inspiration is in each utterance. May we all prove worthy of the cause he is espousing in the trying times ahead. It is very sobering to realize just what the future holds for a boy of my age. On the other hand it is a practical challenge to a man's courage and personal integrity. A man who talks but is afraid to act, who sacrifices principle to expediency whenever real danger threatens is not worthy to keep and enjoy what he has. He is not worthy of his background and heritage who kowtows to tyranny in order to cling to his temporary safety and comfort. This is no expression of oratory or emotionalism but cold, hard truth, I trust I will have the courage to act as I speak come what may. It will not be easy--but should, therefore, can be done. Your mention of Sunday supper at your house brought back memories of the years gone by. What wonderful times we used to have. Do you remember when each member of the clan had to get up in front and recite some piece of poetry? That was a grand idea, and lots of fun. And do you remember the time I gave my highschool commencement address on the Constitution of the U.S. and grandpa with tears in his eyes said it was very good. I certainly do! And that brings to mind the time he wrote me an inspiring letter the theme of which was epitomized in a quotation from Excelsior by Longfellow. I remember the time Uncle Chas. wrote me after our game with Nebraska at Lincoln when I was sophomore. I had had a fine year but in this final game we were licked soundly on a cold, snowy day and I had looked very poor. He said it reminded him of Napoleons failure at Moscow after a series of victories. The comparison was, of course, humorous and intended so. But he also told me to keep my chin out and that there would come another day. Kingsley has written me several times with ideas and suggestions that have proven of value. And of course my mother and father have counseled and comforted to say nothing of inspiration through all these years. Yes, my friends, family, and relatives have been most kind and thoughtful in their criticism, praise and consolation. Life has been good to me--full, enjoyable, happy. Your letters of sincerity and tender love always bring this fact home to me. Much love, Nile P:S: I took the liberty to type this letter because I am pressed for time. Please forgive. Incidentally I live at the Law commons this year & not at the Phi Psi house.